The diabolo is a compound of rubber and plastic. 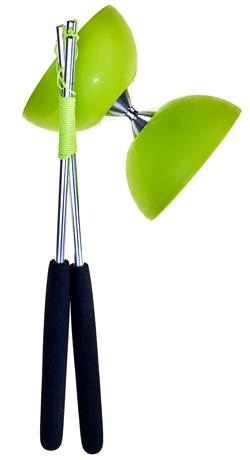 Thanks to its low weight this diabolo is perfect for high-speed performances. Very well balanced and assembled with safety-nuts on anodized hubs. In a net bag for easy travelling. Hand sticks made of aluminum; included. Weight: Diabolo 215 g. / Sticks 77 g.